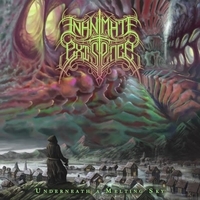 INANIMATE EXISTENCE have been a well-known name in the US Technical/Progressive Death Metal scene. Originally formed in the Bay Area (California), these guys have been active since 2010, and in the seven years of their activity, they have already released four full-length albums. Starting with “Liberation Through Hearing” back in 2012, the debut that showcased a whole new world that allowed the two genres to collaborate between each other, creating a fantastic mix. The second one was the album that gained more fans - although both have been released by the fantastic people behind Unique Leader Records - however “A Never-Ending Cycle of Atonement” was definitely the album that not just gained more fans but gained popularity in general, showcasing even better songwriting, musicianship and talent than the previous one. The latter album dropped only two years later after the debut, and after it (again two years later) 2016 marked the release of their third full-length album, which was definitely their most underrated one. Not a lot of people understood the message behind “Calling from a Dream”, but I personally liked its style. Unlike the first two, this one focused less on speed and more on calm songwriting, plus this one featured female vocals too, which reminded a lot of people of the latest FALLUJAH album “Dreamless”. Since the album dropped last year, nobody would’ve guessed that only one year later these crazy maniacs would come up with a brand new one, calling it “Underneath a Melting Sky”. Although the collaboration with Unique Leader Records ended on this one, the critically acclaimed new label The Artisan Era will release it on August 25th, 2017; the album will feature fantastic artwork done by Justin Abraham and of course eight songs by the three classic members, Cameron, Scott, and Ron. “Forever to Burn” is our first taste of the new album, and even though it took them only a year, they still managed to come out strong with this one. The riffs are incredibly tasty, a bit melodic and overly technical, the vocals are incredibly deep, whilst the entire musicianship (the drums, the bass) sounds well-trained here. “Underneath a Melting Sky” reminds me a little bit of their early works, especially stuff from their second full-length. The song is somewhat calm at the start, but the vocals won’t let it remain that way for too long. Strong, punchy and deep growls dominate on the entire Technical, Melodic and Progressive atmosphere. The guitar tuning is perfect, giving the instrument enough power to remain strong and loud enough to be heard on the song. Although it is quite close to the album release, there is one single you guys can listen to, and it’s the third song on the album – “In Moonlight I Am Reborn”. Before receiving the promo from the legendary Mind Eraser PR, I blasted this song a lot on Youtube; it definitely is special. The intro here is a bit longer than usual, but once the vocals enter and the guitar parts get faster, I immediately realized why this album had to be released through Malcolm Pugh’s label. Knowing what he releases (considering how many albums I have reviewed) he does have a specific taste, and he will release albums that aren’t too fast but just perfect, albums that take precision and hard work to finish. The third song engulfs us more in the album’s beautiful atmosphere with gorgeous, calm passages, and some angry and pretty wicked instrumentals. “Blood of the Beggar” doesn’t mess around too much, and it goes straight to the point. The instrumentals are really deep on this song, giving us a little bit less progressiveness and way more technicality. “The Old Man in the Meadow” is thus far the best song for me, and if I had to pick one that will most precisely describe how this album sounds like, it would definitely be this one. There is absolutely no rush on this one, everything takes its time, the calm intro, the strong riff work; everything is perfect in my opinion. “The Djinn” is a bit of a wicked song, and considering the title, it should be. It has a strong ancient feel to it in the first part, and you’d think that things will speed up slowly, but you’re really wrong. The first vocal part and the riffs kick you straight in the face! “The Unseen Self” is a wickedly fast song and the melodies on this one are sky-high. The guitars here are both strong and wonderful, and somehow charming. The vocalizations are still perfect, but the instrumental on this one is tough to describe, because it’s really good, and although it is the penultimate track, it still showcases serious skill. “Formula of Spores” is the last thing you’ll be experiencing, and once again a slow intro approaches, but it still has a lot to show you. The last song delivers a punch so strong it combines everything you could’ve previously heard on the album. It’s super melodic, super technical and incredibly spiced up with lots of progressiveness, making this the perfect song to end the album. There’s not much left to say. INANIMATE EXISTENCE have once again proved how strong they are in the game, making another perfect album. Make sure to support them and pre-order this one!